The emergence of a distinctive American design idiom in the middle of the 20th century was highly influenced by the tragic and transformative realities of the first two world wars in Europe: the development of the German Bauhaus integrated design school and its teachers/artists relocation to American universities, restrictions on materials, women in the workforce, and the development of many new materials and technologies. Riding high on an attitude of exuberant victory, these new aesthetics and innovations were readily incorporated into architecture and design. It was a time of aesthetic transition and free experimentation, where stylized patterns and formalities of the past were realigned, reinterpreted into geometrics and graphical solutions. A new spatialized idea representing economic, political and cultural ideals. Pent-up demand for housing was released with the end of WWII. Materials were still in shortage, so other innovation occurred as a result. New window types, such as sliding doors were introduced. GI’s returned home, got married and built their own house, wanting a clear separation in style from the past. A building boom followed and suburbs were born. The mid-century style was characterized by a new open planning concept, where spaces were visibly connected rather than separated. Connections existed within the body of the house, and additionally connected indoor to rear exterior space via patios, gardens and landscaped swimming pools. People wanted a playful, grounded, casual existence. A new family room emerged in plans. Entertaining friends and family was a new American past-time. Modern art lead the way, part of the new complete home. Art movements, such as Jackson Pollock, influenced a wild splatter technique; space age discoveries and medical inventions repeated atomic patterns. The love of the automobile was key; not only did it impact open carports, garages and drives, but encouraged reaching rooflines and cantilevers. Automotive and airline design itself was embraced, thru shapes, styles, references to speed, and distinctive colorways. Basic forms of the mid-century home were the ‘ranch’ style, a long gabled brick single story; and the ‘contemporary’, wide open low-sloped wood form, often with an asymmetrical, bold fireplace mass. Coincident to the end of the war, a “Case Study” house program was initiated in 1945 and published by Arts & Architecture magazine which broadcast leading architectural design ideas. Common materials for the period were Japanese paper-like pendant lights, light globes, high-pressure laminates, no wax linoleum and vinyl floors, red and white oak wood plank flooring, wood beamed ceilings, gravel roofing, luan mahogany sliding doors and millwork. Low cost, mass-produced elements, building materials and furniture characterized the period. Extensive windows with clerestories connected spaces, emphasizing the roof slope, organic local stone or stacked brick fireplaces, modern millwork in dining rooms, painted wood face-frame cabinetry in kitchens and baths, with plastic laminate countertops, porcelain colorized built-in tubs and sinks wrapped in aluminum detailing. Knob and radial shaped hardware. Concrete and open concrete block were visibly used for the first time ever, the latter as space dividers and exterior privacy screens. 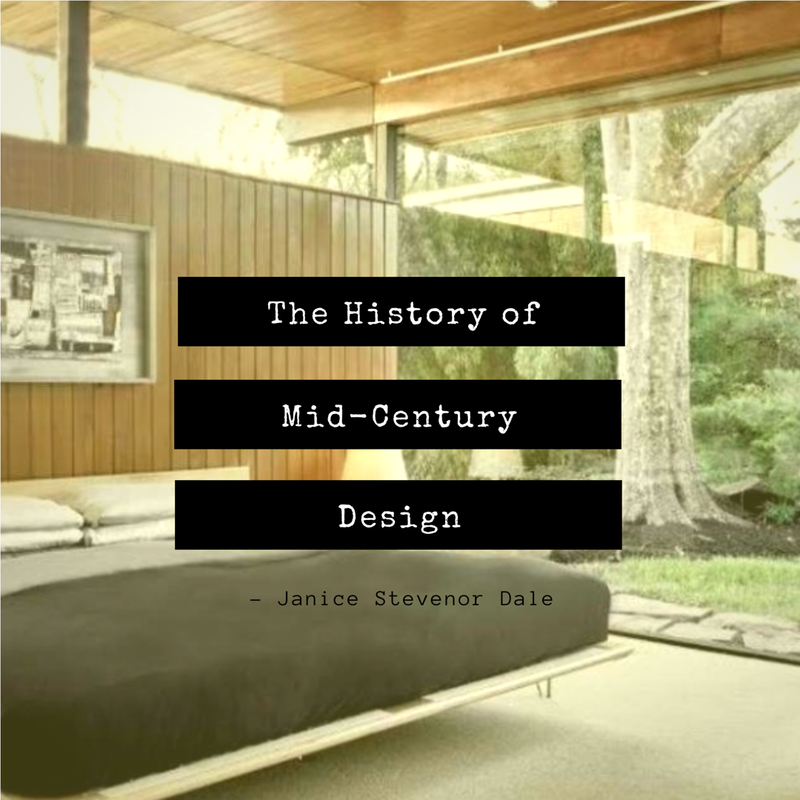 Modern design was all the rage in America in the mid-century and an avid interest in this period is recurring, aligning with the period’s original goal for authentic design integrity, openness and living simply. Written by Janice Stevenor Dale, FIIDA, CID, NCIDQ, President J S D A Inc.
She can be reached at JaniceSD@JSDA.com or +1 213.480.7500. You can also check out JSDA.com for more information.